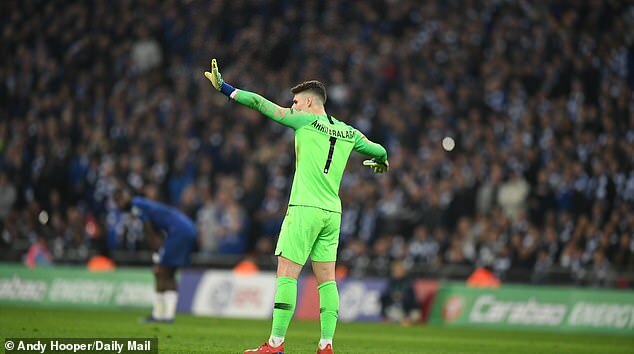 Manchester City retained the League Cup by edging Chelsea 4-3 on penalties on Sunday after an incredible bust-up between Chelsea boss Maurizio Sarri and goalkeeper Kepa Arrizabalaga. The Italian tried to replace the world’s most expensive player towards the end of a cagey 120 minutes that ended 0-0. 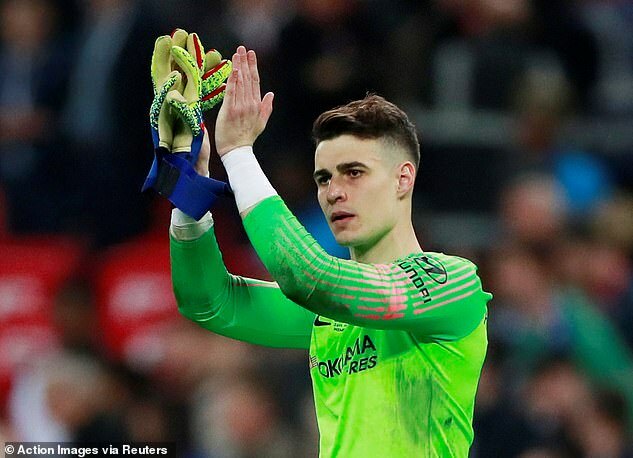 Kepa had received treatment for an injury in the final stages but also has an inferior record of saving spot-kicks than Willy Caballero, who Sarri attempted to introduce. City goalkeeper Ederson denied Jorginho and David Luiz as the duo hit the post in the shootout before Raheem Sterling smashed the winning penalty past Kepa. Until that flashpoint, the afternoon had been a success for Sarri just two weeks on from Chelsea’s worst defeat since 1991 in a 6-0 thrashing at the hands of City in the Premier League. The chances of Sarri losing his job were only heightened by a FA Cup elimination at the hands of Manchester United on Monday. With his back to the wall, it was perhaps understandable then that Sarri adopted a far more cautious approach. Gonzalo Higuain was dropped to the bench to leave Eden Hazard to plough a lone furrow up front — as the Belgian did when Chelsea beat City 2-0 in December. Sarri is an open admirer of City boss Pep Guardiola’s work, but accepted his side’s limitations by gifting City possession and being far harder to break down than in recent weeks. Sergio Aguero scored a hat-trick in the Etihad mauling a fortnight ago, but the Argentine could only volley over with the best chance of a first half with precious few opportunities. City were dealt an injury blow as Vincent Kompany had to replace Aymeric Laporte at half-time, and Hazard routinely exposed his Belgian international teammate’s lack of pace after the break. Chelsea had an anxious wait just before the hour mark for VAR to confirm Aguero was offside after he found the net, but most of the second half action came at the other end. Sarri’s gameplan nearly worked perfectly 24 minutes from time when Hazard let Kompany trailing and crossed for N’Golo Kante, but the French World Cup winner couldn’t keep his shot under the bar. Ross Barkley then curled just off target as Chelsea grew in confidence before more Hazard magic opened up City again only for Pedro Rodriguez’s cross to be cut out when the Spaniard should have gone for goal. Only the finest of margins denied Hazard once more in stoppage time as he raced clear on goal only to see the offside flag go up to Sarri’s dismay. An extra 30 minutes also failed to muster a goal with City regaining a semblance of control. A combination of Cesar Azpilicueta and Kepa prevented Aguero turning home Sterling’s cross from point-blank range. Aguero had one final chance to win it three minutes from time, but Kepa made his best save of the game low to his left before refusing to make way for Caballero. 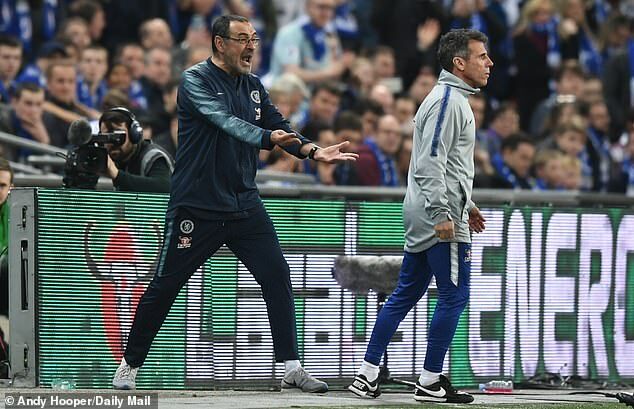 A visibly furious Sarri even started making his way towards the tunnel before turning back to take his place on the touchline. Arrizabalaga did save Leroy Sane’s spot-kick, but should have done better when Aguero’s penalty slipped underneath his body. Ilkay Gundogan also found the net for City before Sterling sealed the start of a potential quadruple of trophies this season by drilling his penalty in off the underside of the bar.